Anti-Aging Treatment The Fountain of Youth? An exciting new treatment has been added to the services provided by Joseph A. Sarnelle, MD. “ECP” which is stands for External CounterPulsation, is now available for individuals with chronic angina (chest pain or shortness of breath). ECP is a safe, non-invasive, outpatient treatment that can relieve or eliminate angina in persons suffering from this condition. It can also increase exercise tolerance. While not everyone suffering from chronic angina pectoris will experience the same level of improvement, it does appear that ECP is an effective therapy for many angina patients. • Suffer with microvascular angina (Cardiac Syndrome X). • Other conditions that increase the risk of complications of revascularization procedures. Diabetic patients are known to be at greater risk for post-procedural complications and elderly patients are at high risk for morbidity and mortality associated with invasive coronary interventions. This treatment carries little or no risk and is relatively comfortable. During a treatment session, the patient lies on a padded treatment bed in a comfortable room. The therapist applies a series of pressure cuffs (like large blood pressure cuffs) around the person’s calves, lower thighs and upper thighs. The cuffs are timed to inflate during the heart’s resting time (diastole) and to deflate during the heart’s contraction (systole). The cuffs inflate and contract sequentially to pump blood from the entire lower extremities to the heart at a time when the heart receives blood. The blood that is pumped to the heart opens up new alternative channels called collaterals, which supply blood to the deprived heart muscle to strengthen it and helps it function better. “Due to this phenomenon, ECP is also called a ‘natural bypass’. The standard treatment cycle is 35 sessions which are scheduled 1 hour per day, 5 days a week, for 7 weeks. Research has shown that ECP improves heart circulation and heart health. In a three year follow-up study, the majority of patients who received this treatment remained free of angina and showed lasting improvements in their nuclear scans. Patients and their families also reported greater ability for the patient to engage in activities of daily living. Joseph A. Sarnelle, MD is pleased to have introduced ECP to our practice. This treatment adds another dimension to our list of services for heart patients. It currently provides relief for many people with serious angina and it has the potential to provide benefit for individuals suffering from congestive heart failure. (3) they have co-morbid conditions which create excessive risk (such as diabetes, lung disease, kidney disease). Most private insurance carriers offer reimbursement for ECP therapy and have established coverage criteria similar to Medicare. If you or someone you know suffers from chest pain please call us today at 732-264-3131 for an evaluation to see if ECP Therapy is right for you. Three year follow-up is fine, but what’s going to happen at five years? In this report Lawson and associates summarize the five year outcome of 33 patients treated with EECP between 1989 and 1992 at the State University of New York. Keep in mind that this was a sick group of patients; 43% had multivessel disease, 45% had sustained a heart attack, 61% had undergone bypass or angioplasty, and 8% had required both. None were felt to be good candidates for further revascularization. Angina improved in all 33 patients, 33% were able to cut back on their anti-anginal medications. In 26 of the 33 patients (79%), the post-EECP stress thallium scan showed a definite improvement; 43% of these "responders" were able to cut back on their medications. Now, how were these inoperable patients doing five years later? Over the five year follow-up period, medication changes were permitted, and 13 of the 33 patients (39%) underwent booster session of EECP. 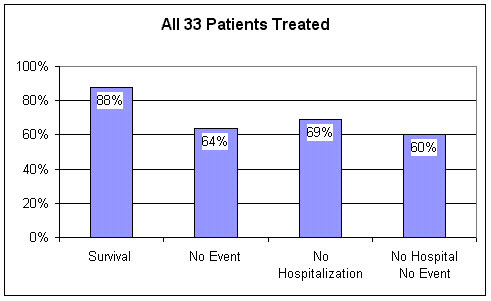 For the entire group, the five year survival following EECP was 88%. 31% of the patients required a hospitalization; 14% sustained a heart attack and 21% underwent a revascularization procedure. 69% of the patients stayed out of the hospital. Overall, 60% of the original 33 patients undergoing EECP for refractory angina were alive and well, event free, and remained out of the hospital during the five year follow-up period. Dr. Roberts’ Comments: We in EECP aren’t "competing" with invasive cardiology and bypass surgery. (In fact, Dr. Roberts has done well over 2,000 cardiac catheterizations and routinely refer patients for angioplasty or bypass). Our focus is to use EECP when bypass or angioplasty are not possible at a reasonable risk. Still, as we evaluate the three and five year follow-up results of EECP in refractory angina patients who were not felt to be reasonable candidates for bypass surgery, it is useful to look at post-bypass outcome in angina patients who were felt to have an acceptable surgical risk. While reviewing this outcome data, keep in mind that the per patient cost of EECP to the Medicare program is about one tenth the per patient cost of bypass surgery. In the Randomized Intervention Treatment of Angina, or RITA trial, patients with symptomatic coronary disease were randomized to undergo bypass surgery or balloon angioplasty. Of the patients treated with bypass, 11% required a repeat revascularization procedure, sustained a heart attack, or died within the first two years following surgery. During the first year of follow-up in the German Austrian Bypass Investigation trial, 18% of the patients undergoing multivessel bypass required a repeat intervention, sustained a heart attack, or died. In the Bypass Angioplasty Revascularization Investigation, or BARI study, 20% of bypass patients sustained a heart attack or died during the first five years of post-surgical follow-up. 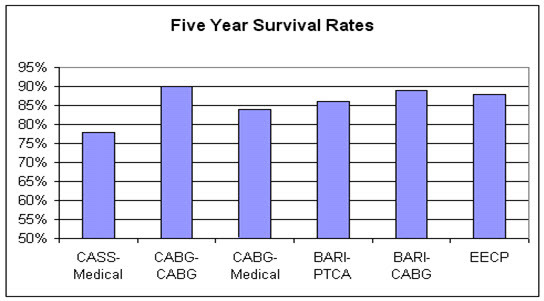 This chart above depicts the five year survival in patients felt to be suitable candidates for bypass, who underwent either medical therapy or a revascularization procedure as part of a clinical study. The last column shows five year survival in patients not felt to be suitable candidates for revascularization, who were treated with external counterpulsation. From the perspective of five-year survival, EECP, carried out in patients who could not undergo bypass or angioplasty with an acceptable risk, worked just as well as did bypass or angioplasty in patients who were felt to be good candidates for these procedures. Now, don’t think for a minute that I am against angioplasty or bypass surgery. The "my way is the only way and all else is second rate" attitude is intellectually foolish and has no place in health care. Many of my patients are alive only because they underwent angioplasty or bypass surgery. The point here is that short-term, 3 year, and 5 year outcomes following EECP in patients who are not good candidates for further surgery is similar to that of acceptable candidates for surgery who do undergo bypass. For more information about our ECP Program or to schedule an evaluation to see if ECP Therapy is right for you please call us today at 732-264-3131. The most noteworthy results to come out of the 2007 American College of Cardiology Scientific Sessions in New Orleans were from the COURAGE trial (Clinical Outcomes Utilizing Revascularization and Aggressive Drug Evaluation). The results of this trial, also published in the online version of the New England Journal of Medicine, have American cardiologists debating, once again, their use of stents in treating patients with coronary artery disease (CAD). In COURAGE, 2,287 patients with stable CAD ("stable" CAD means that acute heart attacks and unstable angina are not occurring) were randomized to receive either aggressive drug therapy alone OR aggressive drug therapy along with stents. The patients were then followed for up to 7 years, and the incidence of subsequent heart attacks and deaths was tabulated. To the surprise of at least some cardiologists, there was no difference in outcomes between the groups. In other words, the addition of stents did not improve the ability of aggressive drug therapy to prevent heart attacks and death in patients with stable CAD. Patients receiving stents did, however, have better control of their angina symptoms than patients on drug therapy alone. It is estimated that over 40 percent of stents being used in the U.S. today are in patients with stable CAD. Should cardiologists stop inserting stents in patients with stable CAD? Or should they just continue business as usual? We can say, after the COURAGE trial that business as usual (at least as formulated above) should stop. Stents should not be used to defuse "time bombs" (i.e., to prevent heart attacks) because this strategy does not work. Patients receiving stents for stable CAD are just as likely to have a heart attack or die as patients treated with aggressive drug therapy alone. This is the message of the COURAGE trial. The COURAGE trial also tells us, however, that if a stable coronary artery blockage is great enough to be causing symptoms of angina with exertion, then a stent is likely to relieve the angina better than drug therapy alone. It is still OK to use stents for this purpose, as long as everyone realizes that it is the symptoms--not life or death--that the stent is affecting. Furthermore, stents have been shown in other clinical trials to improve outcomes in patients having acute heart attacks or unstable angina, and should generally be used in these clinical circumstances. The results of the COURAGE trial are compatible with the current conceptions of how heart attacks occur. Heart attacks are not caused by a stable plaque that grows to gradually occlude an artery. Instead, they are caused by a plaque that partially ruptures, thus causing the sudden formation of a blood clot inside the artery, which then suddenly occludes the artery. Rupturing and clotting is probably just as likely to happen in a plaque that is causing only a 40-percent fixed blockage as in one that is causing an 80-percent blockage. In fact, most heart attacks occur at locations where the underlying obstruction is only 40-60%. So stenting the plaques that are causing greater degrees of fixed blockages will relieve any angina being caused by the blockage itself, but apparently will not reduce the risk of acute heart attacks -- especially since many of these heart attacks are associated with plaques that cardiologists traditionally call "insignificant." Preventing the acute rupture of plaques and stimulating the growth of new arteries (collaterals), and thus preventing heart attacks, is looking more and more like a medical problem instead of a plumbing problem -- and a problem that is best treated with drugs, External CounterPulsation (ECP) Therapy and lifestyle changes. "Stablilizing" coronary artery plaques (making them less likely to rupture) requires aggressive control of cholesterol, blood pressure, and inflammation, regular exercise, and making clotting less likely. ECP Therapy is an FDA-approved, non-invasive procedure that helps your body grow new arteries (collaterals) that naturally bypass the blockages. Aggressive drug therapy will include aspirin, statins, beta blockers, and blood pressure medication (when necessary). This approach, and probably not stents, may be the best way to lengthen the fuse -- or even douse the fuse -- on the time bomb. In China, ECP Therapy is not confined just to the treatment of coronary insufficiency. Stroke, Cerebrovascular Insufficiency, Parkinson’s Disease, Peripheral Arterial Disease (PAD), Erectile Dysfunction, Macular Degeneration, Diabetes, Hepatitis, and even Chronic Fatigue have been addressed with external counterpulsation with measurable benefits. Why should this be? We know that all of these disease states involve free radical tissue damage. ECP increases blood flow to the coronary arteries that serve the heart. Could an increase in blood flow, with an attendant increase in oxygen and fuel supply to the diseased organ be a mechanism of benefit? ECP increases blood flow everywhere, not just to the heart. Organ dysfunction present on the basis of reduced blood flow could thus improve during ECP. In China, arm cuffs are utilized, further increasing blood flow to the brain, and in this fashion ECP is used in the treatment of stroke. This ability of ECP to improve blood flow in general may lead to some additional applications of ECP in this country - research is ongoing and much more is planned. Could ECP Therapy be the fountain of Youth that Ponce de Leon was searching for? For more information or to make an appointment to see if you can benefit from ECP Therapy call Dr. Joseph A. Sarnelle, MD today at 732-264-3131. Chances are, if you’ve ever had a heart attack or bouts of recurring angina, you’ve either had or been recommended to have by-pass surgery or an angioplasty. A coronary angioplasty procedure involves inflating a balloon on the tip of a catheter that has been inserted into a narrowed coronary artery. Performed more than a million times a year, angioplasty is the standard of care for patients with chest pain or a history of heart attack. It is also done on people who have asymptomatic blockages in their coronary arteries. But there’s a problem. Contrary to popular belief, neither angioplasty nor bypass surgery prevents heart attacks nor saves lives in the vast majority of patients. The latest study to confirm this was published in the June 11, 2009 issue of the New England Journal of Medicine. Researchers expected to discover that prompt angioplasty or bypass surgery following a heart attack (compared to medical therapy alone) would improve outcomes in the more than 2,000 patients who had diabetes and coronary artery disease. What they found instead was that when patients had surgical intervention three to 28 days after a heart attack, they had no fewer deaths, repeat heart attacks, or heart failure than patients treated with drugs alone. And during four years of follow-up, there were actually more heart attacks in the patients who had angioplasty! The bottom line is angioplasty, stents, by-pass, and other invasive heart procedures do not, and in most cases, can not prevent heart attacks or prolong lives. Findings from the Coronary Artery Surgery Study (CASS) showed that bypass was a bust. Except for patients with critical main artery blockages or blockages with decreased heart function or diabetes the rates of heart attack and death from heart disease were no lower in patients who had bypass surgery than they were in a similar group of patients treated without surgical intervention. The death rate in the patients who didn’t have bypass was a surprisingly low 1.6 percent per year. The chance that any surgery will improve upon a death rate this low is virtually nil. It boils down to one indisputable fact: You cannot save the life of someone who is not going to die. When you weigh the risk of the procedure, the unavoidable pain and the cost of surgery against the slim chance of benefit, it’s an easy call. Yet bypass, angioplasty, and other “lifesaving” heart procedures continue to be forced upon more and more folks who don’t need them. If hard science and patient benefit were central factors at work here, these procedures would be a rarity. But it has nothing to do with science. It has nothing to do with saving lives. It has to do with money. Period! Every year in US hospitals, nearly 1.5 million angiograms are performed at an average cost of $25,000. There are over 1 million angioplasties at about $38,000 each; and almost 500,000 by-pass surgeries at over $83,000 per operation. These procedures generate more than $121 billion a year—a windfall that makes up approximately 45 percent of the total revenue of some hospitals! That’s why angioplasty and by-pass remain popular, despite dozens of studies that have been conducted over the past quarter-century—not one of them showing that, in most cases, neither of these procedures prevent heart attacks or premature death for the overwhelming majority of people. The millions of patients required to fill beds in cardiac care centers across the country are not that hard to come by. All a heart surgeon or interventional cardiologist has to do is tell them, “If we don’t operate now, you’re going to die in the parking lot.” Presto! Grossly misinformed and frightened, people quickly embrace these “lifesaving” therapies. • Fish Oil: (1 gram daily in 3 divided doses). Fish oil contains both docosahexaenoic acid (DHA) and eicosapentaenoic acid (EPA). There is evidence from multiple studies supporting intake of recommended amounts of DHA and EPA in the form of dietary fish or fish oil supplements lowers triglycerides, reduces the risk of death, heart attack, dangerous abnormal heart rhythms, and strokes in people with known cardiovascular disease, slows the buildup of atherosclerotic plaques ("hardening of the arteries"), and lowers blood pressure slightly. • Exercise: 30 to 45 minutes of cardiovascular exercise (walking, jogging, running, bicycling, etc) 6 times per week. • External CounterPulsation (ECP) Therapy: If an artery becomes clogged, our body’s natural defense is to develop new arteries, called collaterals. ECP is an FDA-approved, non-invasive procedure that helps your body grow collaterals and naturally bypass the blockage. It’s not hard to help patients with heart disease. We simply go back to the basics. Heart disease is systemic; it is not localized to a specific site in a specific artery. It is multi-factorial; it is not just about cholesterol and blood pressure. So it is best treated by addressing all of the factors that increase risk of heart attack. The most disheartening aspect of the bypass-or-angioplasty charade is that it prevents people from receiving appropriate care. Going after blockages with stents or bypass is not always the answer. It just gets in the way—and often makes the situation worse. In my opinion, if we tied the thumbs of all the heart surgeons in America, the death rate from cardiovascular disease would decline dramatically. You need to think this invasive cardiology issue through now, not when you’re lying in the ER with a doctor telling you you’re going to die if you don’t do something right away. To learn more or to make an appointment, call us today at 732-264-3131.